On his first visit to Varanasi after the Uttar Pradesh polls, PM Modi announced and laid foundation stones of various projects on Friday and Saturday. Addressing a public meeting in Varanasi on Saturday, PM Modi took took a jibe at the opposition saying that the BJP’s programmes are not aimed at gaining votes but to assist in the country’s development. “Our (BJP) politics is not for votes, our culture is different. In politics, people do only that task which yields votes, but our character is different. Some politicians work only when it fetches them votes. But we have been brought up in a different culture. … For us, the nation is above all and it is our top-most priority, not votes,” PM Modi said. Inaugurating a ‘Pashu Arogya Mela’ he said “These animals don’t go to cast their ballot. They are not anyone’s voters.” He said proper healthcare of the cattle through such initiatives would help increase milk production in India which is lower than in several countries. The prime minister promised to double farm income. The fair is being considered to be organised for the first time on such a large scale. Approximately 1,800 acres of land is being used for this. Targeting the previous Akhilesh Yadav government in Uttar Pradesh, he said, "The previous government had no interest in giving homes to the poor. After mounting pressure, they gave a list of only 10,000. But the current government has given a list of lakhs of people to avail benefit,” Modi said. 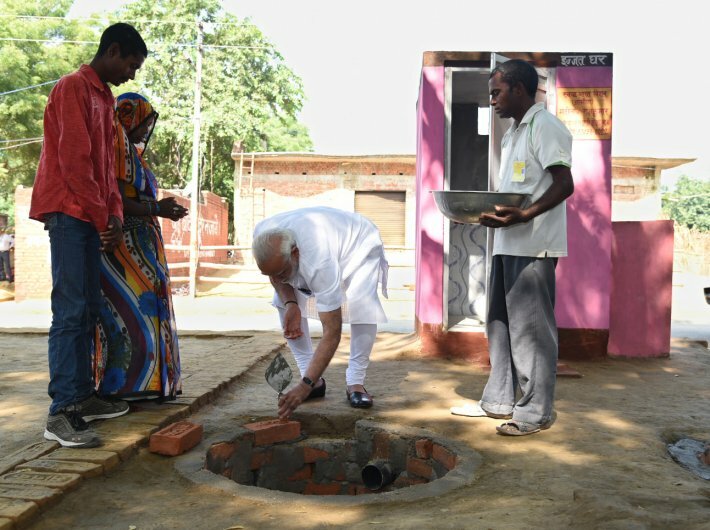 He also performed Shramdaan for the construction of a twin pit toilet at Shahanshahpur village in Varanasi. He interacted with the people, who have resolved to make the village open-defecation-free. He appreciated their initiative of naming the toilet "Izzat Ghar." A trade facilitation centre -Deendayal Hastkala Sankul. The foundation stone of this centre was laid in November 2014.The project was completed before its scheduled date of completion is built at a cost of Rs 274 crores to help and encourage handicraft workers from across the region. Inaugurated a bridge connecting Samne Ghat to Ramnagar. Mahamana Express that would connect Varanasi with Surat and Vadodara in Gujarat. Banking services of the Utkarsh Bank, and unveiled a plaque to mark the laying of foundation stone of the headquarters building of the Bank. Launched a Jal Ambulance service, and a Jal Shav Vahan service to the people of Varanasi, through a video link. He distributed tool-kits and solar lamps to weavers and their children. Dedicated –a waste-to-energy Pahadia STP, restored ponds, 30-bed maternity wing at Araziline CHC, 80-bed barrack at Cholapur police station, Buddha Theme Park in Sarnath, renovated Gurudham temple, Malviya Centre for Ethics at BHU and Chanakya Auditorium at the faculty of education, BHU. Laid foundation stones of –house water connection project, food court of Kashi Vishwanath Temple, sewage treatment plant at Ramna, house sewer connection in trans-Varuna area, 50-bed women hospital, 100-bed MCH wing building at SSL hospital of BHU, upgrading of SPG divisional hospital, DDU district hospital and LBS government hospital, Ramnagar.